For qualified orders, we are offering a discount on high school golf ball orders. 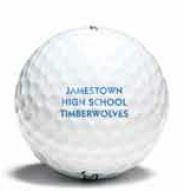 The golf balls must be imprinted with the name of your high school or you high school mascot or both. To remain in compliance with industry Minimum Advertised Price policies, we cannot advertise this discount on our web site. To receive this special discount, just phone or email us at the number or address shown below.